These housekeeping cottages are fully furnished with 3 piece washrooms, satellite TVs and hot/cold water. The kitchens have refrigerators, stove/ovens and microwaves, plus cookware and eating utensils. All you need to bring are linens and food. RATES BASED ON 4, TO A MAXIMUM OF 6 PERSONS. Deposit required at time of booking is non-refundable. 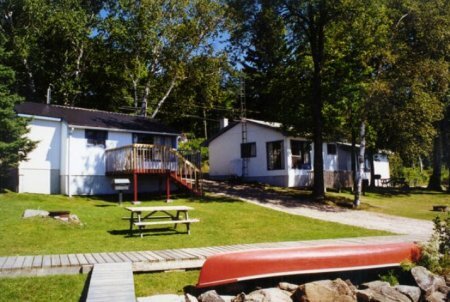 Each cottage also includes a boat slip at no additional cost when booking for a full week. We book cottages by the week from mid June through to Labour Day. Off-season bookings can be daily or weekly. Check our RATES for more info.